As with Costco, bulging SUVs, and childhood obesity, toy haulers bother me. They're just too much. I get why someone might want one: comfort + capacity = fun. But I'll wager that many of us could have a pretty enjoyable experience without schlepping so much stuff around. One couple wanted to travel across the country in their car, but wanted more comfort than a tent could provide. So they found plans for a build-it-yourself travel trailer. Here's how they did it. Chris and Carrie Himes are do-more-with-less types, and they wanted to enjoy this summer's extended cross country road trip using nothing more than their four-cylinder Pontiac Vibe and a little creativity. They found what they were looking for in the Sept. 1947 issue of Mechanix Illustrated — the Trailer for Two. The DIY plans, which can be found on several blogs and websites, called for a small teardrop travel trailer that can be towed behind a normal car. 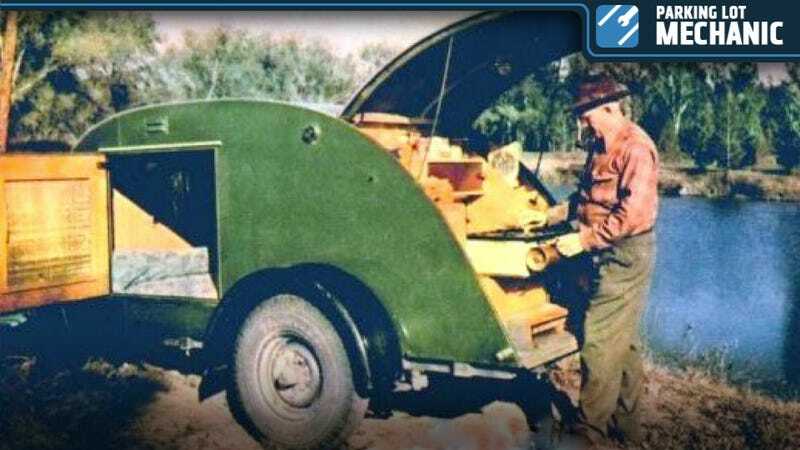 It's so common to hear people say they need a big truck to tow things, but this little camper was designed to trail behind run-of-the-mill 1940s sedans, many of which didn't crank out much more than 100 hp. The Mechanix Illustrated model worked out perfectly for the Himes', whose diminutive Pontiac delivers a modest 130 hp. "It's a little slow on hills, but it's doable," said Chris Himes. The couple could have bought one pre-made — mini teardrops sell for anywhere from $5,000 to nearly $20,000 depending upon options — but Chris Himes said he and his wife wanted to save money. Following the magazine's plans, they had a friend help them weld a frame for it, and then built the trailer's wooden body themselves at home. Neither of them are particular geniuses when it comes to carpentry, but they got the job done. "Once we got the sides up, we just had to figure out how to fill the space," he said. Himes said the 940-pound (empty) trailer cost less than $3,000 to build, and they played with the template a little bit to suit their needs. In addition to altering some of the storage space layout, they also replaced the plan's old style incandescent lighting with super efficient USB-powered LED lighting. They decided not to put in a sink, using the extra counter space for food preparation. When I caught up with the Himes', they were cooking breakfast out of the back of their teardrop at the Colorado Chautauqua in Boulder, Colo. They had already driven from their home in West Palm Beach, Fla. With the exception of a little bit of bubbling on some of the exterior wood — Chris said he'd try using a different sealant — the little homemade trailer had held up well. Now it's your turn. You know you want one of these (I do). Like the Himes', most of us can fabricate the wooden parts for one of these trailers in whatever parking lot we've been using as a garage. Welding a custom frame is a different story. Personally, I'd have trouble doing something like that since I a) don't own a welder, and b) don't know how to weld (yet...it's on my list of classes to take). So I did some digging around and found a company based near Sacramento, Calif. that will build you a custom single axle flatbed trailer of the correct dimensions for $1,568, out the door. (There are probably other companies closer to where you live that do the same thing, but this one picked up the phone and answered all of my weird questions, so they get the official Jalopnik nod today.) That's not bad considering that the trailer is the hardest part to build. And as Hi Sibley noted in the Mechanix Illustrated article, you can make the camper shell removable, allowing you to use the trailer for utility purposes as well. For the few who have complained that Parking Lot Mechanic is too puerile for your taste, here's a project that will keep you busy while I teach your less knowledgable gearhead brethren how to add cool train horns to beater cars and scrape rust off of things. All you have to do is print out the plans and get started.